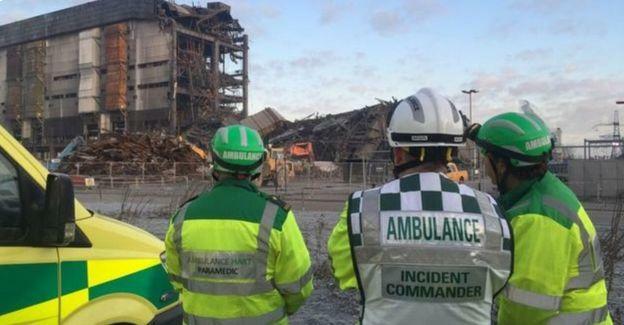 Expert teams have begun to clear rubble and debris from the site of the collapsed Didcot Power Station, according to the Health and Safety Executive (HSE). Rescue teams will also be on hand to recover the bodies of three missing workers, with specialist equipment having arrived on site earlier in the month. The operation comes on the back of serious criticism from the families of the missing workers. The families say that emergency services were too slow to act after the collapse on 23 February 2016. The HSE, in a joint statement with Thames Valley Police, said that “returning the missing men to their families” was their top priority. The executive body added: “Starting Wednesday 16 March, large equipment and people will be arriving on site to start work to enable the recovery operation to resume at the weekend, sooner if possible. Progress with the plan over the coming days will be closely monitored by HSE and Thames Valley Police. “Our priority remains the recovery of the missing men so they can be returned to their families and to understand what caused this incident. Specialist officers from Thames Valley Police continue to support the families and are providing them with regular updates on the progress of this work." Demolition workers Ken Cresswell, John Shaw and Chris Huxtable remain missing.